Google officially revealed that the name of Android N is Android Nougat and the version number to be Android 7.0. The initial previews of Android Nougat announced in March, and we could get the stable release in August. 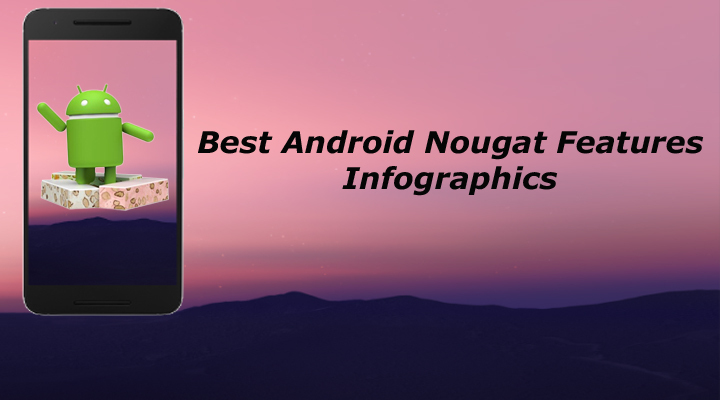 Today we share with you the Best Android Nougat Features, most of them are already present in the latest developer preview. The Android Nougat features Multiwindow, Doze, Improved Notifications, New Messaging Apps, Seamless update and with Vulkan API. Along with these fantastic features, Android Nougat also comes with beautiful sets of Stock Wallpapers. The new Android Nougat comes with many new features including multiwindow or split-screen mode, a completely redesigned and improved notification panel, much improved Android Marshmallow’s “Doze” feature, along with other features. Here is the list of 12 best Android Nougat Features. 1) MultiWindow – Finally we have seen multi-window support for our devices with new Android N. It will show more than one app at a time side by side in a split-screen mode. And the feature is not limited to mobile devices, it also work on big screen tablets. You can be switching the layout from landscape to portrait mode or adjust the size of the window. 2) Improved Notification – Google is now coming with some significant new functionality for notifications. The quick settings have been changed, now when users pull down the notification shade, they see a row of five icons above your Notification. The notification shade has also been improved and organizes. 3) Seamless Update – Android Nougat will come with Seamless update. With seamless update your device doesn’t just download the update in the background, it also installs them. Instead of download an Android update, install it and reboot, Android Nougat will automatically download and install it in the background. And when you next time reboot your device you will get the newer version. 4) Allo and Duo – Two of the most notable additions on Android Nougat will be the new companion-messaging and video chat apps Allo and Duo. Allo is a smart messaging app that comes with built in ‘Smart Reply‘ and ‘Smart Suggestion‘. While Duo is simple, fast one to one video calling app. It’s already called Google’s FaceTime. You’ll be able to get the preview of callers before you pick up. 5) Revamped Settings – Android Nougat introduced a hamburger menu within the settings. Anytime you enter into a sub-menu, you will find an easy to access hamburger button on the upper left side that lets quick access to all the other settings. The setting Menu still divided into sub sections like Device, Sound, Notification. Also, all setting options have a subtitle below every option so you can see basic details of each section. 6) Change Screen Zoom Levels (DPI) – Android Nougat introduces the changing screen zoom level or changing DPI. We saw changing font option in the previous build, but that only change the setting area. With this Android Nougat features, you can change three elements – messaging, app drawer and settings. You can access this feature from Settings> Display> Display Size. 7) Improved Doze – With Android Nougat, Google makes Doze more aggressive and efficient which means battery life and phone performance will even be better. Now the doze goes into effect after your screen has been off for a certain period of time, whether the device is stationary or not which is a vast improvement. 8) Vulkan API – Vulkan API is one of the best Android Nougat Features. Vulkan is a low-overhead, cross-platform API for high-performance and 3D graphics. Vulkan Graphics API optimizes the GPU for better gaming performance. It provides tools for creating high-quality, real time graphics in apps. 9) Number Blocking – Now we have the inbuilt support for blocking the number. Once user blocks a particular number, they will not receive the calls or text from that specific number. It’s a system level number blocking that means this system level list will continue even when you change your device, or factory reset your phone. 10) Direct Reply – Android Nougat will let you reply to your messages directly from your Notifications. You can also choose to bundle their notifications into one card in the notification tray. If more than one notifications come, it bundles the notifications together as a single group. 11) Quick Switch – Now Recent app will show more Apps running in the background with bigger cards. The main changes which have seen in the recent are Quick Switch. Quick Switch lets you switch between your current app and last used app by double tapping the recent button. 12) Google Keyboard Themes and Emojis – The new Version 5.1 of Google Keyboard includes a bunch of colorful theming options and including the ability to set your own image background. The emoji set in Android Nougat is being updated with Unicode 9.0. Google redesigned its emojis to include more human-like characters and skin tones, just like Apple. These are the best Android Nougat Features. Plz, share this infographic with your friends if you like it. What do you think about the new Android 7.0 Nougat features? Comment below to share your thoughts.